This year, just like last year, we conducted our Mt. Apo Holy Week Monitoring Climb using the trail that has been considered as the most strenuous – Sibulan Trail to Mt. Apo on March 28-31, 2013. We departed early from Sta. Cruz and took the Baracatan-Colorado-Sibulan City route with the help of our driver Nong Jun Bolanon from the LGU of Sta. Cruz. We headed directly to the jump off point which was at Cabarisan Tunnel and had a short river trekking off the Sibulan River to HEDCOR’s Plant A. With HEDCOR’s aid, there was a new established foot trail from Plant A to sitio Tudaya, expunging the old trail of Tingting that was already covered with bushes and is very difficult to pass especially for first-timers. We trekked just a little over 30 minutes from Plant A and then proceeded directly to Baruring using the perennial out-of-this-world ride of that Tudaya Power Cab owned by a friend Jepoy Albofera. For the last 4 years, my monitoring team just stayed at Tumpis base camp to check the safety of climbers passing through Sta. Cruz trail, as well as to supervise climbers doing indecent mountaineering practices like leaving garbage in the mountains and those that were not observing the One Entry One Exit Policy. However, with the presence of five first time climbers in Jinggoy, Bryan, Hector John, Chombian and my inanak Franzine; we were forced to climb up the summit on March 29 and trekked back to Tumpis on the 30th. As per record, Sta. Cruz trail had a total of 288 climbers registered. The figure includes tour guides, porters and the members of our monitoring team. The bad news was that it exceeded the maximum carrying capacity by 38 climbers. The good point, on the other hand, was that not all have climbed all the way to the summit. There were others who backed out few hours before the actual scheduled climb. Others have their climbs rescheduled for some personal reasons and there were climbers who just stayed at the base camp and opted to have a side trip to Mundo Apo and Palaka hot springs in sitio Colan. As usual, Sta. Cruz trail has been religiously observing the policy of regulating climbers to climb Mt. Apo in a single season when it comes to trail carrying capacity. With overcrowding as a major issue in Mt. Apo every Holy Week, Sta. Cruz authorities made it sure to really observe the policy so as not to hamper the environment in the name of ecotourism. Another good thing about the climb is that the other monitoring group, Team Palaka of Coronon, had conducted a serious clean up drive through the campsite of Sta. Cruz trail and at the peak of Mt. Apo including Lake Venado. The group unloaded some 15 sacks of garbage from those areas and were turned over to the Ecological Solid Waste Management Office of Sta. Cruz. “For the good of Mt. Apo, we will always do this kahit na medyo mahirap,” said Johnville Tragico, Team Palaka President. 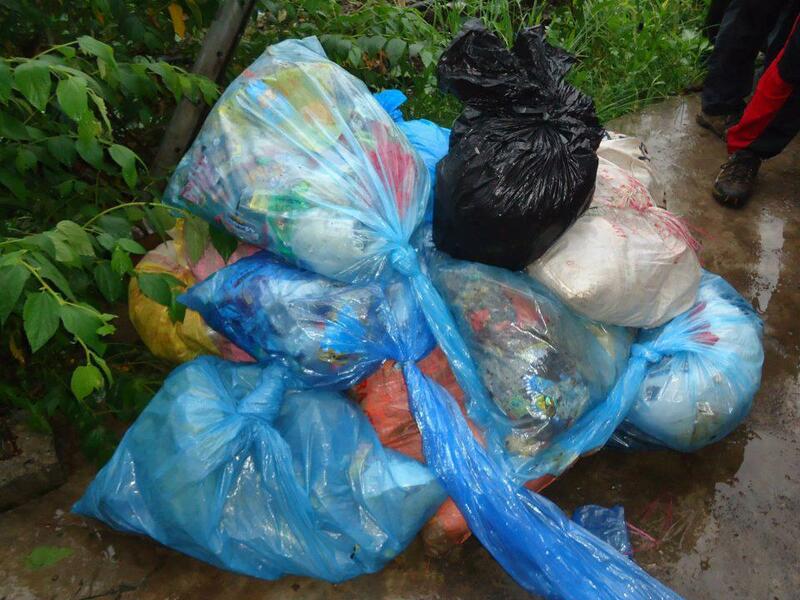 Mr. Tragico even said they experienced hardship not in carrying the trashes but with the attitude of other climbers leaving their garbage in the mountain. To the Team Palaka group, congratulations for a job well done. To the members of LOGSAC who always kept joining this LGU initiative voluntarily, we can really assure that Mother Nature will always be sparing a smile to us in the future. Until the next monitoring climbs.